Whether they’re wanting a glitzy affair at a five-star hotel or a more authentic celebration at a winery or tavern, clients looking to wed in Cyprus have plenty of choice. A recent fam trip with Cyprus Tourist Organisation saw five agents experience romance product in Paphos, Limassol, Larnaca and Ayia Napa – meeting friendly locals and sampling genuine cuisine and culture. Here they give tips on selling to prospective brides and grooms from their first-hand experiences. Despite only becoming an agent in October 2018, Jenni Isherwood, a personal travel consultant at Hays Travel, says the fam helped bring her up to speed on Cyprus’s romance product. Although she was surprised by the range of hotels available, Isherwood says it was the Nissi Beach hotel in Ayia Napa that stood out. Janine Porter, a Co-operative personal travel adviser, agrees, highlighting the hotel’s outdoor spaces as stand-out locations. “Nissi Beach would work well for larger groups. It offers a selection of areas such as the Rondavel Beach Bar – a lovely octagonal-shaped marquee reserved for wedding parties of 25 to 150 people,” she says. Other venues include the 500-capacity Taverna Nissi, 80-guest Thalassa Terrace and the Athena Ballroom, which can accommodate up to 250 people. The property also offers the services of a wedding planner, who will guide agents through all the options available to clients, such as menu choices, music and wedding etiquette. Porter was also impressed by the Elysium Hotel in Paphos. “I thought it was stunning. I loved the fairy- tale-style wedding venue and the accommodation. The staff were so friendly and helpful too,” she says. For Emma Taylor, also a personal travel adviser at Co-operative Travel, it was the Almyra Hotel in Paphos that stuck in her mind. “I loved the beachfront bungalows – they would be perfect for newlyweds. The hotel had fantastic service and friendly staff, and the views of the sunset were perfect,” she says. Of course, church weddings can also be arranged, explains Dr Maria Socratous, tourist officer at the Cyprus Tourism Organisation, who joined the group during their time on the island. “If your clients prefer a religious ceremony, they must apply for a marriage licence at a municipal office before making arrangements for the ceremony at the venue of their choice,” she says. Civil ceremonies are popular too, she adds, with most towns and cities offering venues for non-religious weddings. However, it’s Cyprus’s quirkier locations that have been proving a hit with couples. “There is a trend for clients to choose non-conventional places for their wedding such as wineries, taverns and village squares,” Socratous enthuses. Despite preferring Cyprus’s more traditional locations, Porter admits that the Vasilikon Winery in Paphos would appeal to clients looking for a venue that is a little quirkier. For a more intimate option, the group spent an afternoon at Our House – a small hillside property outside the village of Vavla. Taylor cites the island’s diving hotspots, which are a huge draw for visitors, as an ideal activity for more adventurous newlyweds. She recommends agents check out the Edro III shipwreck in Glyki Nero bay. “You can actually get married in front of the wreck and go diving in the nearby sea caves, although it’s best to check if clients have the appropriate diving qualifications first,” she says. 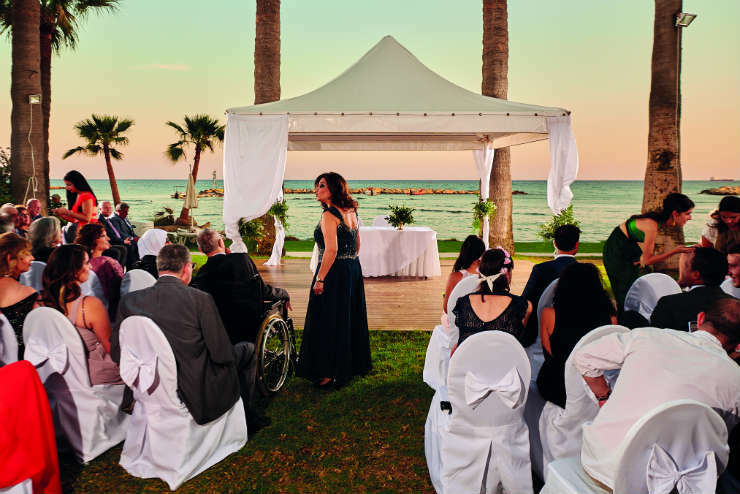 For Isherwood, the accepting nature of the Cypriots and the ease of getting married on the island is a huge bonus for clients planning to tie the knot. For Porter, the expertise of the hotel’s wedding planners and teams at the municipalities is where Cyprus excels. Did you tie the knot in Cyprus or visit on honeymoon? Got any tips from your trip? Email feedback@ttgmedia.com or leave a comment below.